This was a weird one because it is clearly a bug in the software. I am running version 13.6.1.7928 Professional of RedGate SQL Compare and I kept getting this error after performing an upgrade. After trial and error I figured out what the problem was, at least in my use case because maybe it isn’t limited to what I found. This problem presents itself if you have “NOT FOR REPLICATION” on a table and you have the option “Ignore NOT FOR REPLICATION” in your ignore list. You will get the above error upon doing the comparison. I just had to turn that ignore off and it fixed the problem for now. Not ideal, but can’t move forward without doing this. 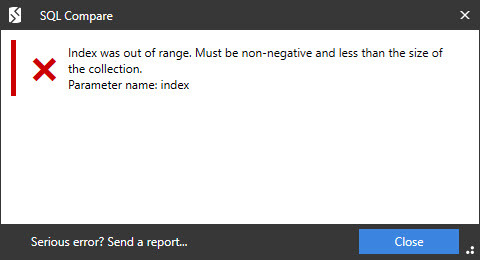 I submitted the error report to RedGate already, feel free to do the same.